My name is Wayne W. Smith and this blog contains my musings related to higher education, tourism and anything else that comes to mind. I invite you to scroll down and laugh where appropriate, cry when necessary but always remember to consider the source. 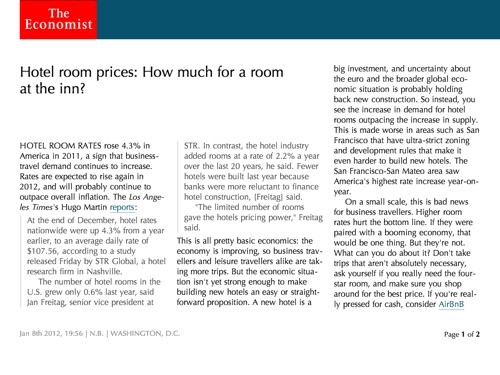 A very interesting report in the Economist outlines how Hotel rates have been rose in the USA by 4.3% in 2011 (average daily rate = $107.56). New building of hotel rooms however, only rose 0.6% indicating that the confidence in this growth is tenuous. I believe this trend will continue. America in terms if HTM is becoming a mature market with limited growth potential. This is mainly due to the short-haul market maturing and the long-haul potential being potentially stunted by the recent developments in the airline industry (see this post as a prime example). 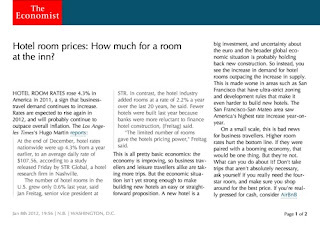 This means that if American hospitality companies are to continue to grow profits, they will have to either merge, expand beyond the USA borders and raise prices. As if it wasn't hard enough for us to go on vacation already :< I don't understand how the economy can be down but rates are up! Ugh. Maybe that's why I'm going into nursing and not economics. I wish that the rates would go down a little. I love taking my family on vacation, but with rising prices in gas, food, and hotels it is getting harder to afford a nice family getaway.